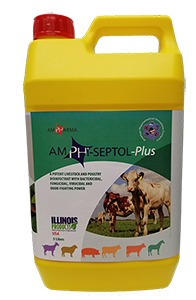 Amphi-Septol is a multi-purpose disinfectant effective against all bacteria, viruses, and fungi found in livestock. Amphi-Septol has been proven effective against the virus H5N1, responsible for avian flu. AmPhi-Septol is a combination of quaternary ammonium and aldehyde, which give it a powerful bactericidal, fungicidal, and verudical. This synergistic combination of active ingredients prevents the emergence of resistant strains. AmPhi-Septol retains activity in hard water and in the presence of organic matter. In addition, Amphi-Septol has ingredients that provide a powerful minty and camphor scent to mask all odors. Amphi-Septol is applied as a spray, with a concentration of 1ml for 2 liters of water. (FOR EXTERNAL USE ONLY). Amphi-Septol is used in wheel dips and foot baths with a concentration of 1 liter / 100 liters of water. Quaternary Ammonium HCL, Sodium Meta Bisulfate, Glutaraldehyde 50%, Peppermint Oil, Eucalyptus Oil, Camphor Oil, Menthol Crystals, and other proprietary micro ingredients including RH 40 Cremophor, Propylene Glycol, BHT, Deionized Water and excipients.